"The safest general characterization of the European philosophical tradition is that it consists of a series of footnotes to Plato." Platōn (Πλάτων, 428/427 or 424/423  348/347 BC) of Athens was a Greek philosopher: the first Western philosopher, in fact, from whom we have complete surviving works. His importance is neatly summed up above. He is also the major source for info about his mentor Socrates, of whose life he wrote many Real Person Fics. Aristotle studied under him. A central concept of his philosophy was the theory that everything we perceive in reality and every idea we have is an imperfect representation of an ideal, archetypal, unchanging Form, the nature of which can only be understood through reason. The Platonic Cave originated as a metaphor for the relationship between our actual perception and this more fundamental reality and as an illustration of another metaphor, the divided line, itself a simile for our perceptual progression. Beauty Equals Goodness: Averted, yet also mildly played straight. To Plato, Goodness Equals Goodness. That said, he had four names for the "ultimate idea" - "the good", "the one", "the truth", and "the beautiful". Bureaucratically Arranged Marriage: In Laws. The idea was that people should be married according to their ability to produce the finest children, and that men who do not marry before a certain age should be fined a certain amount. Canon Discontinuity: He would censor all disgusting behavior attributed to gods in Classical Mythology. Democracy Is Bad: Plato referred to "democracy" as one of the degenerate forms of government in The Republic, second only to tyranny. However, he's almost certainly not referring to "democracy" as we would understand the term today. He refers to democracy as an excess of liberty, where obeying the law is optional and people are slaves to their own desires. It is likely a critique of Athenian Democracy as it existed during his time (which he absolutely loathed for putting his teacher to death), but Plato's beef isn't so much with the form of government so much as it is with the attitude of its people and rulers. Regardless of what kind of institutions a state has, whether popularly elected or hereditary, if people routinely disobey the law and behave on instinct, it is a democracy. Most modern republics and constitutional governments based on the rule of law are derived from his writings on this particular point, or at least Roman interpretations of them. Divided We Fall: Averting this trope is one reason for the Canon Discontinuity. Due to the Dead: Socrates jokes about in Phaedo: to bury him, they would have to catch him. They will only bury his body. Be of good cheer, then, my dear Crito, and say that you are burying my body only, and do with that whatever is usual, and what you think best. G.I.F.T. : His allegory of the Ring of Gyges may be the Ur-Example. 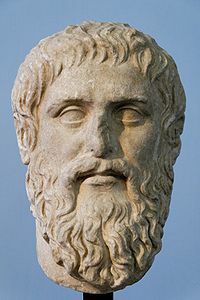 Plato presents a thought experiment: would a person given a ring of invisibility, and thereby the ability to commit any sort of action he pleased with no consequences, still live a virtuous life? Good Feels Good: Part of his philosophy was that living a virtuous life made a person happy in and of itself. That's also how he resolved the above-mentioned problem of the ring: even if the invisible man wasn't directly punished, he'd still live a life of extraordinary unhappiness if he did evil things while invisible. Good Republic, Evil Empire: A common theme in his political writings. Plato considered a government which obeyed the rule of law and followed wisdom to be the best of all states, run by merit and working for the good of all people. By contrast, Plato's description of the evils of tyranny are shocking and prescient. Hobbes Was Right: He did not approve of direct democracy as it existed in his day, and believed the best form of government to be, essentially, the rule of the most enlightened and wise men of society. Of course, he predated Hobbes by a couple thousand years, and wouldn't have agreed with him on many other things (like the possibility of finding the wise men of society, to say nothing of their differences in the meaning of the highest good). He did, however, prefer the evils of democracy to the evils of tyranny — which is exactly what you'd get if you screwed up the absolute-rule thing. The Last of These Is Not Like the Others: Plato's last dialogue — The Laws — is the only one that doesn't feature Socrates. It is also one of the few that takes place outside of Athens, the longest by a substantial margin, and the only one to deal strictly with political philosophy. Left Hanging: Several of his dialogues end without having answered the question posed at the beginning. Socrates never hesitates to comment on it. Logic Bomb: (See the Anvilicious entry on the YMMV page) If you could explain it, they would already understand in the first place, but you have to explain it to them so they can learn to understand (it could be argued that as it was meant for his students anyway this was its purpose in the first place). Mood Whiplash: Countless instances of 'By Zeus, you're right, Socrates!... I think.' in his dialogues. Reasonable Authority Figure: The Philosopher Ruler/King/Guardians. Screw This, I'm Outta Here! : In Euthyphro, when the titular character's definitions of piety are skewered by Socrates, he excuses himself in a way that seems like he's just tired of talking about it. Socrates, who was hoping for something he could use to defend himself in his upcoming trial, is somewhat annoyed. Speech-Centric Work: Many of his works, such as The Republic, are presented as dialogues between two characters. Theseus' Ship Paradox: The Trope Maker, in his dialogue Parmenides. Plutarch, a later Platonist, named and codified this trope in his biography of Theseus. The Treachery of Images: This is one interpretation of his Theory of Forms: the objects that you see in the world are not "real", they are merely reflections of perfect forms that exist in a world beyond this one, which can only be perceived by reason. Utopia Justifies the Means: Played straight in Republic, where Socrates discusses what lies to tell to lower classes, and why and how people should be "removed" if they are a problem. That said, a combination of Values Dissonance and general misunderstanding of the dialogue have caused people to exaggerate the extent to which this trope is in effect. Plato's issue isn't so much with liberty and/or intellectual or artistic freedom. Rather, he was afraid of the effect that irrational appeals to the passions would have on the ideal state. Because of that, he believed that things such as art and oratory should always be directed towards morally-upright ends, and that public opinion should be molded so that the people would value virtue and a love of wisdom over things such as honor and material pleasure. And, of course, that's assuming that Republic is meant to be a work of political philosophy at all; ever since the Roman Republic, students of Plato have put forth convincing arguments that Republic was a dialogue about justice, not a blueprint for a perfect state. note It's worth noting, however, that Plato did experiment with political philosophy by instructing and sponsoring a ruler of Syracuse. However, that happened before Republic was written, so it's unknown if and how the two are related. Wisdom/Prudence: Giving good counsel for the benefit of others and society. A virtue of rulers. Courage: Discernment in what should be feared. A virtue of soldiers. Temperance: Moderation in all things, control of desire. The virtue of the peasants. Justice: Rendering unto every person their due. The ultimate virtue found in all classes. Yes-Man: Since the dialogues which Plato wrote are basically just author tracts, Plato has Socrates spout off very extensive lists of premises that are simply immediately accepted by everyone present. Characters can go on for pages only saying, "Yes," "Certainly," "Very true," and "No doubt," while Socrates talks for paragraph after paragraph. He is mentioned in the "Bruces Song", aka "Philosopher's Song" by Monty Python, a comedy song featured on The Monty Python Matching Tie and Handkerchief, the live album Monty Python Live at Drury Lane and in their Concert Film Monty Python Live at the Hollywood Bowl. Appears as one of the protagonists of the fourth Glory of Heracles game.